Sunny Florida is host to a great many things, from Disney World to Cape Canaveral to the Everglades. On the southwest side, Cape Coral just below Tampa, is the home to the newly formed classic rock band, Newmachine. The band was formed by a veteran of the genre, drummer Ryche Green, whose resume includes a bevy of great rock bands, including Bullet Boys, Pink Velvet Krush, Saints of Rebellion, and Outlaws & Moonshine. He's joined by cast of like-minded fellows, mostly Floridians, Tommy Williams (v), Jim Miller(b,) and Polo Staber(g), with one Fightin' Illini Lorenzo "ZO" DelVecchio (g). Karma is their debut album for HighVolMusic. Newmachine is somewhat of a misnomer. One listen to Karma and you know the band is rocking things old school. 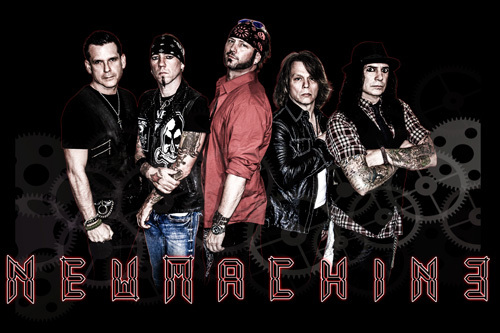 The Newmachine sound is straight out of Eighties melodic hard rock and metal, with twists of Sunset Strip sleaze, Southern rock, and a subtle blues vibe. Because of this, the music and songs are driven by the usual, and natural, suspects of the genre: contagious melody, harmony in vocal arrangements and twin guitars, a sturdy beat and groove from a solid rhythm section, and clean melodic vocals. To expand on these things a tad more, riffs play a large part here and in turn generate some impressive lead solos, with notable burners within Livin It Up and Nowhere Fast. On the vocal side, Tommy Williams can sing from soothing smoothness (Hold On) to strong and edgy passion (Lost). Even more, stealing a page from classic Eighties rock, background vocals often turn on gang vocals as within Hell To Pay or Nowhere Fast. Digging in a little deeper, you'll find that Newmachine's songs also turn on hooks to pull you in, wrapping their songs in AOR accessibility. Like the refrains of Hell To Pay and the very catchy Love Is Crazy, the Southern rock guitar conjouring within Everglades, or the massive groove from the bass and drums within No More. That last song has some sweet, yet slight, acoustic accents and synth orchestration. 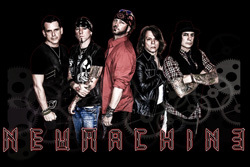 Suffice to say, with Karma, Newmachine came out swinging and hit a home run, by creating some mighty fine and very entertaining classic melodic hard rock. Here's hoping this album won't be a "one-off" gig for the band. Easily recommended. 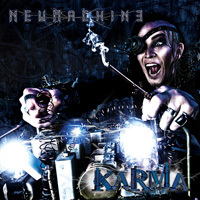 With Karma, Newmachine came out swinging and hit a home run, by creating some mighty fine and very entertaining classic melodic hard rock. Here's hoping this album won't be a "one-off" gig for the band. Easily recommended.